Looking back, I think I must have been spoiled. I was born in Worcestershire, spent the next 18 years on the Suffolk/Essex border before moving to London when I was at University. It was there that I started going to the many pubs with Irish music and developed the love for that music that I still retain today. Both of my grandmothers sang. My paternal grandmother was Gaelic speaking. She was born in Co Galway and had many relations back in the west of Ireland. As a schoolboy I often spent the summer holidays over there. I was surrounded by music yet I never really noticed it. I was more interested in Bill Haley, Buddy Holly and later, country blues. Ironically, by the time the folk song revival of the '60s had given me an interest in the music, it was too late to listen to my grandparents. Fortunately for all of us, not every one was as blinkered as I was. Brian Mathews, an enthusiastic amateur, carried a tape recorder with him around Sussex in the late 1950s and early '60s recording traditional singers and musicians wherever he found them. This is Musical Traditions first CD release of the new century and the second from the Brian Matthews Collection. It features 51 live recordings made in various Sussex Pubs between 1959 and 1965. The bulk of the recordings were made in 1959 and 1960 around mid Sussex. 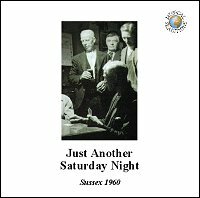 Two very well known singers, George 'Pop' Maynard and George Spicer do get almost half of the tracks between them but there are telling contributions from less well known, or at least less recorded, singers. It is especially good to see a platform being given to Jim Wilson, Harry Holman and Jim 'Brick' Harber. Harry Holman does contribute one song, There was a Poor Thresherman to Topic's Voice of the People (Topic TSCD670 There is a Man upon the Farm). As far as I know, no other recordings are currently available of any of them. They are all fine singers and deserve to be better known. It was a real delight to hear Harry himself singing his best known song, The Life of a Man. The song gave its name to Ken Stubbs book of songs he collected in Southern England and was much sung in the revival. The performance here makes a nice contrast with George Townshend's (Come Hand to Me the Glass MTCD304). George, singing in his own home, is rather more restrained, but both sing the song very well. Brick Harber is not a singer I had previously heard. That was my loss. He has a strong, deep voice and a style which is not quite typical of that found in Southern England - he was born in the Midlands but moved to Sussex as a young boy which may explain his singing style. Here he is with The Cabin Boy and the Lady Gay, a song I had never heard before (sound clip). The timing of Brian's recordings was indeed fortuitous as three of these singers - Pop, Jim and Brick - would be gone within the next two years. We could well be hearing Jim and Brick's last recordings so they do have a special historical interest. The remaining recordings are perhaps even more exciting. They were made in The Three Cups in Punnets Town, near Heathfield in East Sussex in 1965 and feature a previously unknown traveller singer, Sarah Porter and other members of her family. She is an excellent singer in the typical traveller style and several of her songs have been rarely found in the tradition. The South of England in the 1950s and '60s was a popular area for collectors and it seems quite remarkable that such a good singer would, but for Brian Matthews, have slipped through the net. I have to admit to taking a special delight in the traveller singing style. The CD devoted to gypsy singing (My Father s the King of the Gypsies, Topic TSCD661) is amongst my favourites of the Voice of the People CDs that I have heard - and I very much enjoyed MT's earlier offering from Wiggy Smith and family (Band of Gold, MT CD 307). At first hearing it is not an easy style but does handsomely repay repeated listening. Sarah's songs include a classic ballad, The Outlandish Knight, a beautiful version of The Bitter Withy and a stunning, if fragmented, The Wind Across the Wild Moor (sound clip). The last of these is really little more than a sentimental 19th century broadside song, but Sarah somehow injects real emotion into the story of a young girl with her baby at her breast freezing to death at her father's door. In intensity of emotion I was reminded of the tale of The Lass of Roch Royal arriving at Lord Gregory's door with their dead baby. Brian Mattews tells us that Sarah's sons are still living in Punnets Town. Is there any chance of an ongoing family singing tradition? Having moved to Sussex in the mid '70s, I was fortunate to have heard three of the featured singers in person. I have been pleasantly surprised by all of their performances here. Louie Sanders (Fuller) is still with us and still singing. She contributes just the one song, Young Maria, a version of the song I know as Oxford City. It is not a very complete version of the song but somehow it says as much in 5 short verses as many songs do in twice the number. The performance is superb. It is one of the outstanding tracks here - I have never heard her sing better. By the time I got to hear Cyril Phillips, he was doing his country yokel act. The songs he sings here are light hearted and mostly of music hall origin, bur they are all very enjoyable it's also quite obvious that the crowd is having great fun. I especially enjoyed The Rest of the Day is Your Own. So too do his audience - just listen to the final verse (sound clip). On these CD s he sounds a much better singer than I remember. The real revelation to me though is George Spicer. I heard him only on a couple of occasions (I was more familiar with his son Ron), but I did buy his Topic LP, Blackberry Fold. I'm afraid he was never really one of my favourite singers so I was surprised when reading back through the notes I had made whilst listening to these CDs at just how many times I had written positive comments against his tracks. The Folkestone Murder is one of two songs from the earlier LP that reappears here. In the notes it is described as "A horrible song with few redeeming graces". It is certainly a very unpleasant story, but George's performance is outstanding, certainly much superior to that on the Topic LP. The tune is not really very special. I thought it rather slight for such a dramatic and tragic song. George sings with great style and control and unfolds the story quite beautifully. By the end of the song I was genuinely moved by the plight of Caroline and her sister. What better testament could there be to the quality of the singing? Throughout the CDs he has such a presence and commands attention even in a noisy bar. I can understand now why he was held in such esteem by his fellow singers. He was still a relatively young man and in fine voice so these could well be the definitive recordings of him. Here he is with The Scarlet and the Blue complete with rousing patriotic chorus (sound clip). It s a song which, along with The Life of a Man and The Oak and the Ash, I have been driving my colleagues at work to distraction with for the past two weeks. 'Pop' Maynard is, with some justification, regarded as one of the great Southern English singers. He was a true country man and spent his whole life on the Surrey/Sussex border. In his time, he engaged in all manner of country occupations and crafts. He had a large and varied repertoire, including several classic ballads. His singing style is typical of Southern England. He does not use exaggerated ornamentation but instead uses more subtle effects like slowing or speeding the tune or including a slight pause to heighten the dramatic impact. In common with many other singers from the area he frequently repeats the last two lines of each verse. This works very well in a pub setting with the repeated lines acting as a refrain that the audience can join in with. Pop was almost 90 when these recordings were made, but do not be put off by that. His singing has a vitality and energy that quite belies his advancing years. Here he is, with audience participation, singing The Poor Weaver's Daughter (sound clip). Other outstanding performance from him here include The Week Before Easter, Down by the Seaside and William Lennard. Brian Matthews recorded a total of 29 songs from him in 1959/60 of which just 11 appear here. Had more been included, the CDs would have had a rather unbalanced feel. It would also have meant limiting the contributions of some other singers. Amongst the songs not included here are two of Pop's best known songs, Polly on the Shore and William Taylor, good versions of ballads like Broomfield Hill and stock country songs including Sweet Primroses and While Gamekeepers Lie Sleeping. No doubt, at least some of these will feature on a future Topic production. In the meanwhile, all Brian Matthews' recordings of him are available from MT on (Down the Cherry Tree, MTCD400-1). The performances are well varied. There are perhaps more ballads (including two versions each of Oxford City and William Leonard, both of which songs are known under a myriad of titles) and fewer songs with a music hall origin than I might have expected and just a couple of pieces of music. The playing order has been well chosen so that there is a nice mix of singers and serious songs sit comfortably alongside the more light-hearted ones. This careful programming makes it easy to listen to the CDs through at a single sitting. With so many fine tracks to choose from, it does seem rather invidious to single out individual ones for special mention but there were four that delighted me, each for rather different reasons. I have always thought of Scan Tester as the archetypal Southern English musician rather than a singer, but here he sings The Lakes of Coldflynn, in a nice, if rather, straightforward way. I never thought I would hear an English traditional version of The Croppy Boy, which for some inexplicable reason has always been a favourite song of mine, but it turns up here sung well by Ted and Bet Porter. I suppose it was inevitable that if anyone in England were to sing it, it would be Travellers. They seem to have a special affection for songs of Irish rebellion. Over the years, I have become attuned to associating Spencer the Rover with the Copper Family so it was good to hear an admittedly incomplete version from Jim Wilson. The Coppers are the repository of so many of these songs and, probably because the current generations are still singing them (and long may they continue to do so), it is easy to think of their version as the definitive one. It is just as easy to forget that they do also crop up quite frequently in the repertoire of other Southern singers. Finally, hearing Bill Agate playing an untitled Polka on mouth organ and tambourine reminded me that Scan Tester really was not the only musician from Sussex! Musical Traditions have previously set a high standard with the booklets that support their CDs. The one that accompanies this release is the longest yet - it runs to 36 A5 pages and is nicely illustrated and full of useful, interesting and well-researched information. In addition to the usual, excellent song notes, there are thumbnail sketches of the singers and musicians and a contribution from Reg Hall explaining how these Sussex pub sessions came about. If his conclusion is correct, and I have no reason to doubt it , then we have much to thank Mervyn Plunkett for. I was especially impressed with the piece based on Vic Smith's interviews with Bob Lewis. It does really evoke memories of times gone by. It also contains the news that George Spicer's wife was a fine singer too and that her son, Ron, made recordings of her. I wonder where they are now? Can I also add a couple of comments to the song notes. Regarding The Pride of Kildare, Rod Stradling says "Not a song I've encountered before" but it is a song I remember quite often being sung by revival singers in the 1960s. I also vaguely recall that I once had a version on LP with pipe accompaniment, so that suggests The McPeakes. I did own a Fontana LP, I guess issued about 1966, by younger members of the family which certainly included Brennan on the Moor. My father hardly ever sang, but at family gatherings he was sometimes pressed into singing what I took to be his only song, the final verse only of Do You Want us to Lose the War (sung on the CD by Bill Porter). Dad was a regular soldier, a Sapper who was stationed for many years between the wars at Chatham, so I would guess the Army to be the likely source for the song. There are several other CDs of pub singing available. John Howson has just released the famous recordings the BBC made at the Eel's Foot, Eastbridge in 1939 and 1947 as Good Order (Veteran 140CD). Neil Lanham has 3 CDs of recordings made some 20 years later at Butley Oyster, the Eel's Foot and Snape Crown (NLCD3, NLCD7, NLCD8). These do all include much fine singing. The next projected release in the British series of Rounder's Lomax Collection is The Blaxhall Ship Recordings. The Musical Traditions CD is the only one that is not from Suffolk and, for me, wins out, not just because I am an adopted son of Sussex, but mainly by virtue of the sheer quality and variety of performance and the very detailed accompanying leaflet. These are live pub recordings made on a domestic tape recorder so inevitably there is some background noise and the singers are not always accorded the best of order. Nevertheless, the recording quality is never less than adequate and the quality of performance rises above any such considerations. Rod Stradling and his team of collaborators have, over the past couple of years, produced a valuable series of recordings of British traditional singing. This could well be their finest achievement to date, giving us as it does performances from George Spicer, Cyril Phillips and Louie Fuller in their prime and other excellent singers who are not available elsewhere on record. If you have any interest in English singing, this CD is essential listening. Those of us who love and value this music owe a vote of thanks to MT for making these recordings available, to Brian Matthews for having the foresight to make the original recordings, to Chris Hickson who generously sponsored the production costs, but most of all to the singers. Let's hope that such records encourage us to sing their songs again - what better memorial could there be for them? I have only the one regret that I was not present when these recordings were made. What wonderful evenings they must have been. Just try listening to Jack Arnell and company with Scan Tester playing in the background, without joining in (sound clip). Such sessions are probably gone for ever so I will just have to make do with this lovely CD.